Arbitration & Conciliation Act, 1996, S.48–Execution of Award—Foreign arbitral award—Relevant date for conversion of foreign currency into Rupee is the day when the objections under S.48 were finally disposed of. Comments Off on Arbitration & Conciliation Act, 1996, S.48–Execution of Award—Foreign arbitral award—Relevant date for conversion of foreign currency into Rupee is the day when the objections under S.48 were finally disposed of. Arbitration—Different agreements between several parties for a single commercial project and all the agreements are interconnected—In such a case all the parties can be covered by the arbitration clause in the main agreement even if in some agreement there is no arbitration clause and such parties are not signatory to main agreement containing arbitration clause. Arbitration—Plea of Fraud—Duty of the Court is to impart “sense of business efficacy” to the commercial transactions pointing out that mere allegations of fraud were not sufficient to decline to refer the parties to arbitration. Comments Off on Arbitration—Different agreements between several parties for a single commercial project and all the agreements are interconnected—In such a case all the parties can be covered by the arbitration clause in the main agreement even if in some agreement there is no arbitration clause and such parties are not signatory to main agreement containing arbitration clause. Arbitration—Plea of Fraud—Duty of the Court is to impart “sense of business efficacy” to the commercial transactions pointing out that mere allegations of fraud were not sufficient to decline to refer the parties to arbitration. Arbitration—Agreement with labour union providing a mechanism to help parties settle terms of contract in dispute cannot be construed as an arbitral agreement. Comments Off on Arbitration—Agreement with labour union providing a mechanism to help parties settle terms of contract in dispute cannot be construed as an arbitral agreement. Arbitration—Objections— No appeal is provided against an order condoning the delay in filing the petition u/s 34 of the Act as such—Hence, the remedy of Letters Patent Appeal against that decision is not available. Comments Off on Arbitration—Objections— No appeal is provided against an order condoning the delay in filing the petition u/s 34 of the Act as such—Hence, the remedy of Letters Patent Appeal against that decision is not available. S.34—Objections—Interest on interest— Award granted by arbitrator included principal and interest which collectively amounts to sum payable—Interest on sum payable is permissible and does not amount to interest on interest. Comments Off on S.34—Objections—Interest on interest— Award granted by arbitrator included principal and interest which collectively amounts to sum payable—Interest on sum payable is permissible and does not amount to interest on interest. 34—Objections—Limitation—Period of limitation prima facie has to be reckoned from the date of supply of copy of the award. Comments Off on 34—Objections—Limitation—Period of limitation prima facie has to be reckoned from the date of supply of copy of the award. 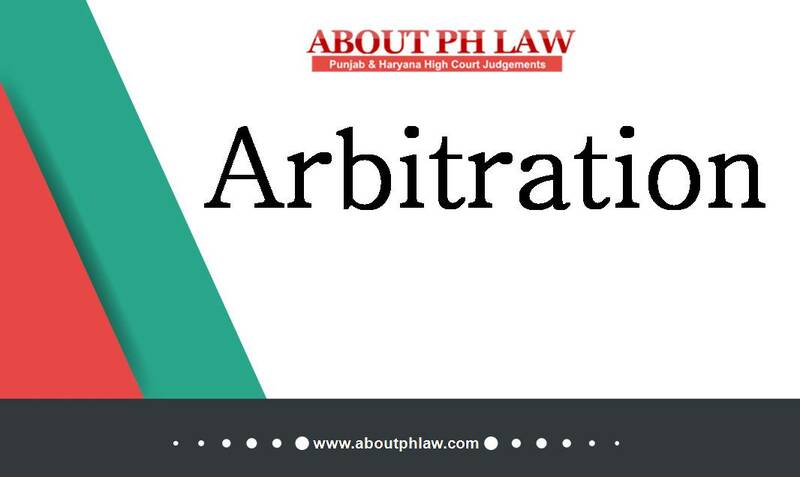 Arbitration & Conciliation Act, 1996, S.11(6) & S.12(5)–Arbitrator–Appointment of- -Once the arbitrator has become ineligible by operation of law, he cannot nominate another as an arbitrator. The arbitrator becomes ineligible as per prescription contained in Section 12(5) of the Act. It is inconceivable in law that person who is statutorily ineligible can nominate a person. Comments Off on Arbitration & Conciliation Act, 1996, S.11(6) & S.12(5)–Arbitrator–Appointment of- -Once the arbitrator has become ineligible by operation of law, he cannot nominate another as an arbitrator. The arbitrator becomes ineligible as per prescription contained in Section 12(5) of the Act. It is inconceivable in law that person who is statutorily ineligible can nominate a person. Multiple Remedies—When two remedies are provided under a statute even in inconsistent, would continue to be in operation until one of them is elected for application. Arbitration—Execution of Award—Award holder sought recovery under relevant statute as arrears of land revenue—Not necessary that arbitration a ward has to be executed as per provisions of 1996 Act only. Comments Off on Multiple Remedies—When two remedies are provided under a statute even in inconsistent, would continue to be in operation until one of them is elected for application. Arbitration—Execution of Award—Award holder sought recovery under relevant statute as arrears of land revenue—Not necessary that arbitration a ward has to be executed as per provisions of 1996 Act only. Arbitration—Issuance of notice under S. 21 is not a mandatory requirement. Comments Off on Arbitration—Issuance of notice under S. 21 is not a mandatory requirement. Arbitration Agreement—Application under S.8 (1) can be filed without original deed or certified copy there of but at the time of consideration by Court of merits original or certified copy has to be brought on record. Arbitration Agreement—Un-registered Partnership Firm—Arbitration Clause in partnership deed—Dispute can be referred to arbitration. Comments Off on Arbitration Agreement—Application under S.8 (1) can be filed without original deed or certified copy there of but at the time of consideration by Court of merits original or certified copy has to be brought on record. Arbitration Agreement—Un-registered Partnership Firm—Arbitration Clause in partnership deed—Dispute can be referred to arbitration. Territorial Jurisdiction—Printed clause on the invoice pertaining to jurisdiction is binding. Comments Off on Territorial Jurisdiction—Printed clause on the invoice pertaining to jurisdiction is binding.